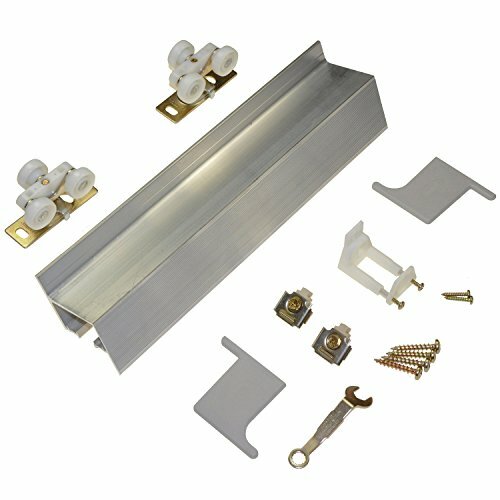 The 2610F is a versatile and easy to install wall mounted sliding door hardware set ideally suited for application where the installation of a Pocket Door is not structurally possible or not cost effective. Possible applications include closets, storage rooms or anywhere space is limited and a wall mounted sliding door will suit. The 2610F is for interior use only and not suited for external applications. Grade: Commercial Grade ANSI Certified Application: Interior Commercial / Residential Door Thickness: 1-3/8" [35mm] or 1-3/4" [45mm] Max Door Width: 1/2 Track Length Max Door Height: Unlimited Weight Capacity: 125lbs. [57kg] Track: Aluminum extrusion, integrated fascia, mill finish Steel Components: 14 gauge, zinc trivalent plated Wheels: 1120 All nylon wheel, factory greased axle Country of Origin: USA Bullets change to: Easy To Install, Saves Space Wall Mounted Jump Proof Aluminum Box Track With Built In Fascia Smooth Rolling Adjustable & Detachable Door Hangers For Easy Installation Adjustable Door Guides For Smooth Open/Close Operations Max Door Weight 125lb.